Origin and Habitat: Lower and lower Upper Sonoran Zones; from the vicinity of San Diego and Santa Catalina Island, California, southward a few miles beyond Rosario, Lower California. USA. Altitude: from sea level to 300(-500) metres. Habitat: It grows on mostly sandy soils of the coastal chaparral and hillsides never nicer than a few miles from the sea, and some of the Channel Islands along with Rosa minutifolia, Aesculus parry, Echinocereus ferrerianus, Mammillaria dioica, Opuntia prolifera, Opuntia cholla, Opuntia californica, Opuntia oricola and several others. Throughout its range, rain falls mainly in winter, and temperatures are moderated by maritime air. In habitat often fires burn Bergerocactus emoryi stands, but afterwards new stems sprout from the tuberous roots. Its habitat is threatened from urban development. 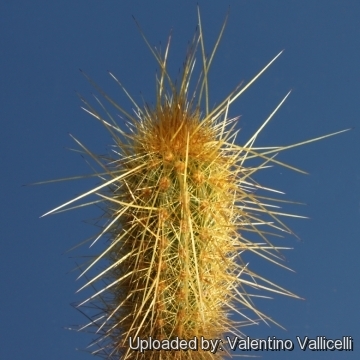 Description: Bergerocactus emoryi is a golden spined shrubby cactus, much branched near ground level, that often forms large thicket of stems to several meters in diameter. 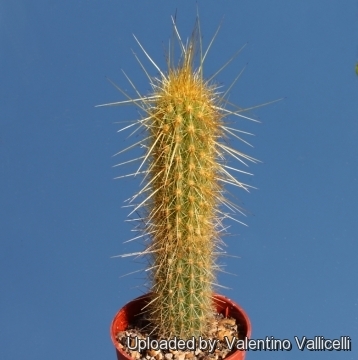 Stems (Branches): Cylindrical, frail, 0,2-1,5(-2) m long, 2-4(-6) cm in diameter, stout, erect, ascending or procumbent, spreading then rooting on the lower side (eventually producing new plants), entirely clothed with a dense mat of bright yellow spines, turning gray to nearly black in age. At the end of each year's growth, the stems become slightly constricted, forming annual segments. Individual stems live about ten years. Ribs: (14-)16-18(-25), inconspicuous only 2-3 mm high, somewhat tuberculate. 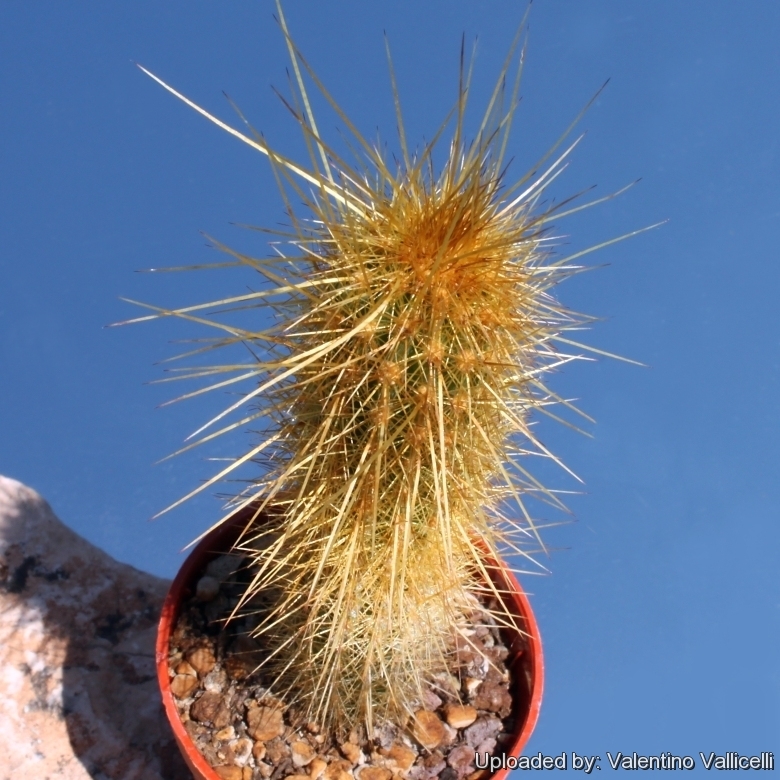 Spines: 10-30(-50), slender-acicular dense, often obscuring the stems, yellow but darkening with age, strongly unequal, the 1-3(-6) central of which stouter, the main one bent backward, 3-7 cm long, others spreading, more or less straight. Flowers: Diurnal, yellow, 2-6 cm broad when expanded. Pericarpels and floral tubes felted and spiny. Outer perianth-segments obtuse, obovate 5-8 mm long, lemon-yellow, tinged with green, inner segments narrower, oblong, 8-10 mm. long, almost or quite devoid of the greenish tinge. Seeds: Oblong to obovoid and flattened, black, shining, pitted, about 2,5-3 mm long. Blooming season: Flowers appear throughout the spring on stems 1-5 years old. Notes: Two natural intergeneric hybrids have been described X Myrtgerocactus lindsayi (Bergerocactus emoryi X Myrtillocactus cochal) and X Pacherocactus orcuttii ( Bergerocactus emoryi X Pachycereus pringlei), none of them form self-sustaining populations. 1) Raymond M. Turner, Janice Emily Bowers, Tony L. Burgess “Sonoran Desert Plants: An Ecological Atlas” University of Arizona Press, 2005. 8) Bailey, L.H. & E.Z. Bailey. “Hortus Third” i–xiv, 1–1290. MacMillan, New York. 1976. 11) Hickman, J. C. “The Jepson Manual: Higher Plants of California 1–1400.” University of California Press, Berkeley. 1993. 12) Munz, P. A. “Fl. S. Calif.” 1–1086. University of California Press, Berkeley. 1974. 13) Shreve, F. & I. L. Wiggins. “Veg. Fl. Sonoran Des.” 2 vols. Stanford University Press, Stanford. 1964. 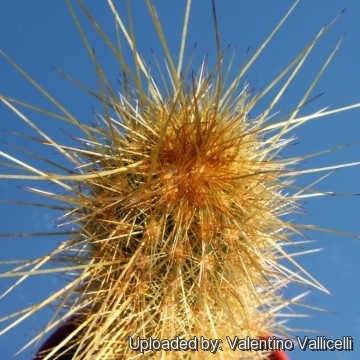 Cultivation and Propagation: Bergerocactus emoryi is of relatively easy culture, and suited to hanging baskets as well as pots. Repotting: Since they are relatively rapid growers need plenty of space for their roots, repotting with fresh potting-mix should be done every other year or when the plant has outgrown its pot. However, repotting doesn't necessarily mean they'll need larger containers. Watering: They require moderately watering through the growing season. This can be done weekly or more frequently during the summertime, if the weather is sunny enough, but allow to dry fully before watering again. Kept this way, plants will show a healthy growth. Keep rather dry as soon as the temperature starts dropping in October and keep it dry in winter. The plant survives outside without protection in winter (cold hardy to -2° ) but is then somewhat prone to rot, too. They should be preferably kept dry during hot weather (especially if grown in the ground). Hardiness: Winter care presents no problems at temperatures from 5 to 15 degrees centigrade with plenty of light, but frost hardy to -2°C for short periods if very dry. This plant needs a period of cool rest in winter to produce flowers abundantly. Cultivated plants do best where summers are relatively cool.